It’s only the first (or second, if you’re in engineering) week of school, and I don’t know about you, but I’m already tired of this alarm clock life. One thing that always helped me stay motivated through the school year are travel plans! It’s never too early. Work hard now, study with a photo of a beach or a flight itinerary on your bulletin, whatever it takes to get you through the year. Whether you’re thinking of a short escape this Reading Week or thinking ahead to post-exams (hello, four month summer! Is there ever a more perfect time? ), here are some of the destinations I have on my bucket list. For when I graduate/have free time/have money/need a break. Of course. Maybe it’s a result from listening to too much Jack Johnson. I’m convinced the answer to world peace lies within the sweet pineapples in Hawaii. Lush green cliffs, ukulele music, slurping cold coconut drinks, I don’t think it gets more mellow than this. Its culture is as colourful as the lei around your neck with a population mixed of Filipino, Japanese, and Polynesian people. It’s even reflected in their cuisine! Ever tasted spam sushi? Me neither, but I’d eat a whole plate if it meant getting to stay in Hawaii for a week or so. Another American state completely detached from the mainland, this would be a beautifully isolating experience. Kayaking between icebergs, seeing humpback whales, giant brown bears, and breathtaking mountains. Toto, I have a feeling we’re not on Gould Street anymore. Because of how north it is above the Arctic Circle, the sun is up for 24 hours a day starting around May and it doesn’t set until early August! Alternatively, in north Alaska in the winter, they can go for six weeks without sun.In terms of travelling here, you could fly or take a cruise, and get dropped off on land. Although, this would be an expensive trip, maybe save it for later in life. I already had two states on the list, might as well add the whole country. But really, say what you will about ‘Murica, you’ve got to admit, a road trip from coast to coast would be amazing. From hot springs, to sky-scraping buildings, each state is like a new country. I’d give a trip like this at least a month. Grad road trip for this summer, maybe?! I’ll admit it right now. I don’t know much about Australia, other than I need to snorkel in the Great Barrier Reef. Also, since watching Finding Nemo, I wonder if the East Australian Current in fact like a superhighway for sea turtles and fish. I need to see for myself. Righteous. Last movie inspiration, promise. This one comes from too many viewings of Jean-Pierre Jeunet’s Amélie. I wouldn’t want to go by myself though, I’ve heard PDA is publicly acceptable in Paris, whether it’s on the steps of Sacré-Cœur Basilica, or in front of Notre Dame, it could be either a very romantic or very lonely trip. Everything from the people, the countryside, to the French Riviera looks absolutely beautiful. Pavement cafés, scooters, taking two hours to eat lunch, oui, s’il vous plaît. Brushing up on my grade 9 French, maintenant. Everyone’s wanted to go to Japan at some point in their lives. This is a universal fact. Whether it’s for the food, the fashion, the traditions, films, anime, music, etc. Japanese culture is irresistible. In me lives a tiny weeaboo who would probably implode with happiness if the chance to go to Japan ever arose. In Toronto, we pay expensive prices and get mediocre Japanese food. Imagine going to the fish market, or getting mouth-watering steamy hot ramen, katsu curry or teppanyaki at a low price too. Incredibly clean, and even more safe, I would love to enjoy the every day lives and stroll through Shinjuku and grab a Pocari Sweat from a vending machine, take the futuristic Shinaknsen bullet train, and get lost in the Shibuya scramble. As pristine and chaotic the cities are, you can slow down by soaking in a natural hot spring, visiting ancient temples, and seeing the endearing gasshō-zukuri buildings in the village of Shirakawa-go would calm any mind. No wonder they live such long lives. The biodiversity, the ecology, the creatures you can’t find in any other place in the world. These archipelago of volcanic islands, part of Ecuador, inspired Charles Darwin and his theory of natural selection. Could these islands’ natural wonder change my way of thinking as well? Where else in the world could you see bright red frigate birds, the blue-footed booby, several hundred-years-old tortoises, penguins, iguanas, sea lions, Darwin’s finches, and the flightless cormorant who has lost its ability to fly? I’ve left the best for last. Ryerson’s own history professor Arne Kislenko, and one of the most influential people in my life, once described Southeast Asia as a “cultural crossroads.” Islam meets Buddhism, China meets India, it’s a total fusion of worlds. I was fortunate enough to join the student-run, volunteer team Alternative Spring Break at Ryerson in 2011. 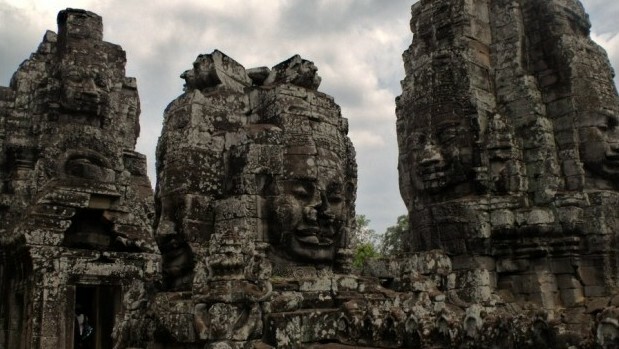 I experienced the culture in a couple of the mainland Southeast Asia countries (Vietnam, Laos, Thailand, and Cambodia). There is still so much left to discover. It is a completely different culture from country to country. Burma, which is constantly in the news; Indonesia, which has a larger Muslim population than any other country in the world; Singapore, which has financially developed at an exponentially unbelievable rate in the past decades; and Laos and Vietnam, two countries still struggling with the Communist governments. You have the quite Westernized city of Bangkok, and just to the north by a couple hours, still in Thailand, there are families living in the mountaintops, with little to no electricity. It’s a region of the world that’s still growing, rich in culture, and quite affordable to travel. Now, this is only a fraction of the places I want to travel to, the list continues. Tell me what countries I’ve missed, though! If you could go anywhere in the world right now (or after your four papers, two presentations, and one midterm), where would you go?